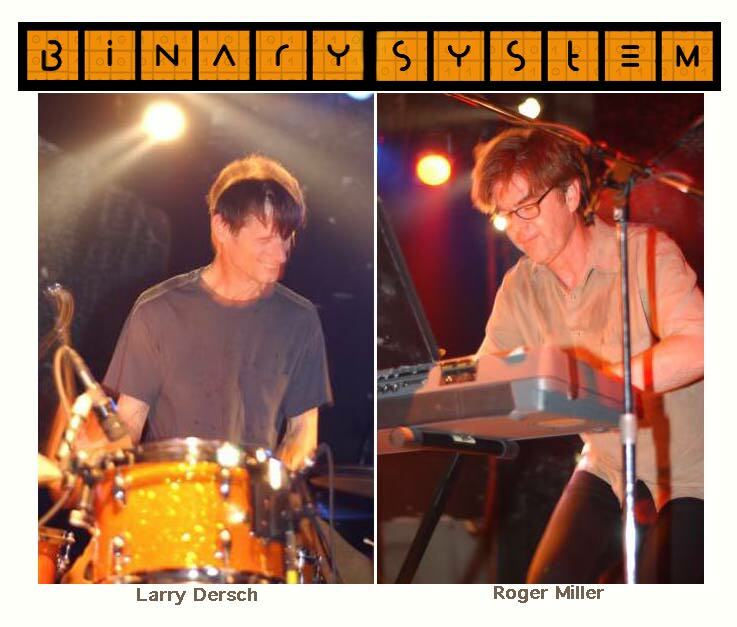 The Binary System is currently in the mixing stage for their next (4th) CD. Many of the current songs in the live shows will be on this disc: "Beat the System", "Red Criss Cross", Missy Elliot's "Scream", and others. Michael Bierylo is the recording and mixing engineer, and is co-producing with Roger. The sound will be quite a jump from their last disc: studio as artform, rather than recreation of a live performance. "Roger writes complicated music - they learn it, they internalize it, and then they play it like they're playing 'Louie Louie'." (Russ Gershon, founder of The Either Orchestra: All Things Considered, Aug.2001). For Binary System, rhythm and melody are so tightly intertwined that they become one. Keyboard player Roger Miller offers a pulsing, throbbing counterpoint to drummer Larry Dersch's insistent beats. Yet he also manages to achieve a rare balance with forward-looking, constantly evolving, thematic development. Based on Invention Box, it's clear that these two players have spent enough time together to develop a signature musical voice and speak as one. The musical range of Invention Box spans diverse territory. At times the duo draws from free jazz (as on the loosely metallic piece "Texas"); at others it explores progressive improvised rock a la Can (as on "Rogue Wave"). The counter-intuitive ways Binary System connect different sounds offers plenty of intrigue and fascination. But somehow, with just two voices, they manage to travel from rock to funk to jazz (and back) without any unneccessary stops along the way. The greater organizing force on Invention Box defines itself quite early on as the beat. Occasional hiccups (performed in perfect synchrony) leave no doubt that portions of this music are clearly pre-arranaged. Yet frequent periods of discovery and evolution also establish a prime role for improvisation. Binary System offers a unique approach to groove-based improv on Invention Box--far enough off the beaten track to offer general interest, yet so thoroughly rooted in its rhythmic foundations that listeners will never find themselves lost in its swirl.